The mission of the Monticello Area Chamber of Commerce, Inc., a 501(c)6 non-profit membership organization is to provide the leadership to promote Monticello and the surrounding area MACC members. MACC will serve as a catalyst for the development of business and industry in the area and shall gather and disseminate information to its members and other interested parties. NETWORKING OPPORTUNITIES – This is one of the most important benefits of membership. Networking and new business contacts help your business grow. We hold monthly meetings offering you an opportunity to network to introduce yourself and your business to other chamber members. CREDIBILITY – 68% of consumers believe that chamber membership is a sign of a reputable, stable business. 70% believe that it demonstrates that you use good business practices. Being a member of the Chamber gives you credibility. VISIBILITY – Members are provided with a membership certificate and window cling to display at their place of business proudly showing chamber membership. Members can also show the Chamber logo on their advertising, marketing and PR materials. CHAMBER BUCKS: Each year over $30,000 is redeemed locally using Chamber Bucks Gift Certificates. That money circulates through our local economy, supporting our MACC members and their organizations! Purchased at the MACC office, Chamber Bucks are one of the area’s favorite gift giving ideas. This program allows the recipients to redeem their chamber bucks at over 100 different locations. It’s the perfect way to Pay It Local and give the Gift of Choice! REFERRALS: As a membership organization, we offer free referrals to member businesses. When your potential customers call, we refer them only to MACC members who provide these services. This is another chamber benefit that helps to grow your business. SIGNATURE EVENTS SPONSORSHIP: You can highlight your business by sponsoring signature events, managed by MACC volunteers and open to the entire community. These opportunities provide excellent exposure for your business. 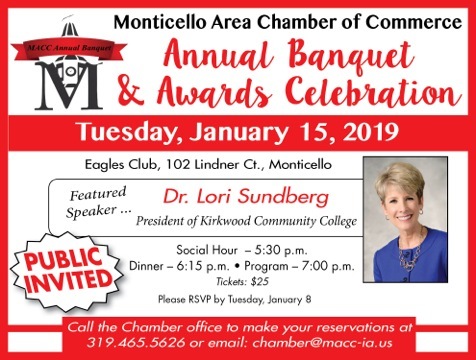 The MACC was created as a membership organization to promote the business and industry interest of Monticello, Iowa and the surrounding area. The Monticello Express, dated August 10, 1933, announced “New Chamber of Commerce is Established”. 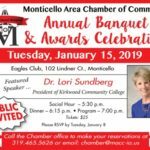 It was reorganized throughout the years and in October 1989 became incorporated as the Monticello Area Chamber of Commerce, Inc.
MACC is made up of a nine-member, volunteer board of directors who is elected by the organization’s membership. The Board employs a director to lead MACC in promoting and supporting local businesses and industries. The Monticello Area Chamber of Commerce is here to answer your questions, be your source for information about Monticello and the surrounding areas, and serve its membership. Please stop by our office at 204 East First Street in downtown Monticello during normal business hours of 9:00 a.m. to 5:00 p.m. Monday-Thursday. Visitor and tourism information (maps, pamphlets, etc.) is available 24/7 in the lobby.